Sort of a beefed-up, unfiltered Version of their Helles. On-draught @ Ayinger Speis und Trank in Munich. Cost was 4.60 euro/.5litre - steep, even by Munich standards (e.g. Augustiner serves beer at 2.70/.5litre). Some unbunged kellerbier-like character gives it some liveliness. Munich and pils malts dominate. Grassy Hallertauer/Noble hop character. Crisp and clean, with plenty of vitaminy saccharomyces character. Balanced and approachable, with a pleasant refreshing taste. A kiss of subtle spice/clove from the yeast. No fruity esters, though. Highly drinkable and enjoyable. Another solid brew from one of Munich's best breweries. Yeah it's dear at 4.60 a pint, but sure it's worth a go once. The carbonation is way too high, though. It's the excellent Jahrhundert Bier with the added characteristics of a kellerbier, full of citrusy yeast and sporting a fittingly cloudy appearance. It's extremely refreshing, smooth and slightly creamy on the tongue. A shame I didn't buy more. Had this at the ayinger braustube in aying, Germany last week. Wow! Truly the best lager I've ever had. 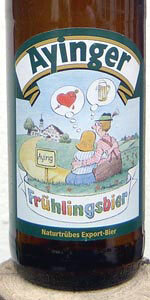 Also for the record this beer is an unfiltered version of the jahrhundart beer, unlike the "hefe" the site reads it as. T- upfront noble hop flavor that is very balanced but assertive. Then a very earthy malty finish that lingers. O- my favorite beer I had in Germany and it really does deserve every bit of a perfect rating. A: Pour is all white thick lovely head at first, but rather quickly the murky straw-colored liquid rises as the head settles. Rich lacings. S: Rich wheat - ripe banana, very sweet. Citric notes. Bread and honey. T: Follows the taste, but a bit bitter and more citric. The breadyness is stronger than the banana. M: Light body and rich carbonation. Aftertaste is rather short. O: A Berliner Weisse, no way - no lacto bachteria. As a Hefe not bad at all - I see that my rewiev is of a Hefe and not a Berliner Weisse. Slightly sweet and malty outing from Ayinger; bottle from JF. Pours a hazy golden with short, foamy head. Aroma is malt, grass and hay. Taste is more of the same, with some sweet tanginess. Finish is dry with a lingering tanginess on the palate. I had expected more from Ayinger, better spring seasonals to be had in Germany. The label says nothing about it being a weissbier. 500ml bottle with the seasonal Ayinger cap. Best by: 10/11. It pours a hazy whitesh gold, much like a Berlinner Weisse or witbier. The head is white and fluffy but leaves no lacing. It smells really fresh and inviting. It is lightly bready with some honey sweetness, lightly fruity, with a springy hop note. The flavor is a bit tart. It is lemony and fruity with a slight bit of hop bitterness. The finish has some earthy fruitiness. Overall it seems to just wisps across the tongue. It isn't light Per se but the mouthfeel is very smooth velvety. It is a good pick for a spring or summer beer for sure. Found this on the shelf at the downtown Munich Reve grocery, apparently the only bottle the store received by mistake. Mine! Surprisingly enough, I saw more Ayinger Stateside than in Munich. Upon R&D every description categorizes this brew as a Keller Bier, not a Berliner Weiss. I'll let the tasting make the decision. Onto the aromatics. A tart musty lemony aroma greets my nose. a bit of yeast funk, fresh grain, toasted bread,overripe pears, Meyer lemon, finishing with a musty grain/fresh citrus combo that is extremely enjoyable. A buttery note rounds out aroma. I could smell this all day long. This is really nice stuff especially after a winter of overly sweet German bock/dunkles It's musty and funky enough to be a Keller bier, yet the lemon acidity immediately recall Berliner Kindl Weiss. Light, delicate and tart on the palate. Lemon, grain, yet rounded out by a slightly buttery character The carbonation is cleansing and finishes the brew with a light tongue tingling acidity. The mustiness i more dominant than in other Berliner Weiss beers I've had, and this leans in the Keller bier category. Highly enjoyable light brew. Unfortunately the aroma is several notches higher in power than the flavor.